Provide comfort for the family of Lucille Coble with a meaningful gesture of sympathy. Lucille F. Coble, 100, formerly of Milesburg, passed away the afternoon of Tuesday, January 15, 2019, at Mount Nittany Medical Center, surrounded by her family. She had been a patient there since January 12, 2019, and a patient at Centre Crest, Bellefonte, PA since March 2016. 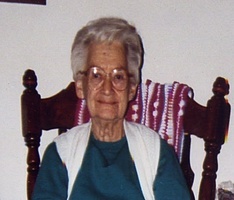 Lucille was born on January 30, 1918, the daughter of Virginia Aikens and Clarence Stanley, both deceased. In 1937, she married Harold W. Coble, who preceded her in death in 1965. Lucille is survived by two children, Joan L. (Coble) Dunlap of Bellefonte and Leslie A. Coble at home in Milesburg. In addition to her parents and husband, she was preceded in death by a daughter, Shirley A. Confer of Zion. Lucille was the last of her generation. For most of her life, Lucille was a homemaker. After her husband’s death, she worked in the cafeteria at Wingate Elementary School until her retirement in 1985. In her spare time, she enjoyed knitting, gardening, reading and working on various word puzzles. She loved dogs and all animals. She was a wonderful mother to her children and despite several setbacks in her life, always managed to provide and care for her family . She will be greatly missed by her children and by those who had the pleasure of knowing her. Lucille’s children wish to thank the staff and nurses at Centre Crest and Mount Nittany Medical Center for the care provided to their mother. Services will be private at the convenience of the family with internment in the Advent Cemetery, Moose Run Road, Milesburg, PA. Arrangements are under the direction of the Dean K. Wetzler Funeral Home in Milesburg, PA. I have known Mrs Coble since I was a little girl growing up in Milesburg. She was one of the most pleasant, sweetest ladies I ever knew. It was an honor to live and grow up by her and her family. She will deeply be missed by those who knew her.